Synopsis: Ichabob Crane is sent to investigate the brutal decapitations of a three people in Sleepy Hollow. While investigating he learns about the story of the horseman, which he believes just to be a myth. Then he sees the headless horseman for himself and has to try to find the head of the horseman and return it to the grave to send the horseman back to hell before everyone in the town is killed. 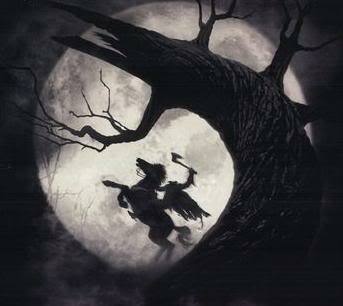 Sleepy Hollow is right down Burton's ally. The creepiness and darkness are waiting there for him which is just his style. Although he uses Johnny Depp, the Burton Staple, he doesn't base the movie solely on that start power. He keeps great film technique, good lighting, suspenseful dialogue, and an interesting plot which come together to create a great, entertaining film. It's one of my favorites of Tim Burton.